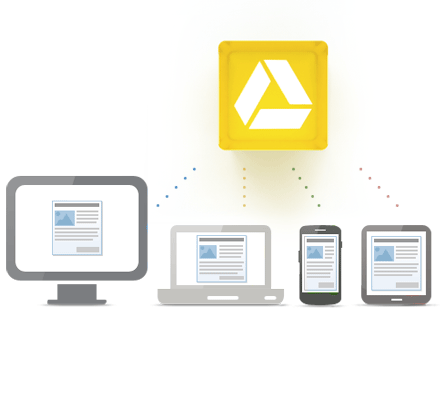 It’s been rumored to be coming for weeks and now Google is launching it’s own “Dropbox” competitor called Google Drive. From what I can tell so far it’s going to work pretty much the same as Dropbox with a few exceptions. It’s already available for Windows, Mac, Android and will soon be available for iPhone/iPad. It should allow you to save files in an offline folder on your computer and then upload those files to Google Drive and be available on all of your other devices. So any change you make to that file on any device is automatically synced across all you other devices. So how is this different from Dropbox? Well in a few ways. First off while Dropbox only gives you 2GB for free Google is giving you 5GB. While Dropbox allows you to get more space for free when you refer your friends Google is not offering that at this time. But if you want to buy more space Google is much less expensive than Dropbox. The first option to purchase an upgrade for Dropbox is 50GB for $9.99 per month. Google will sell you 25GB for $2.50 per month. Another nice feature of Google Drive is that it will play or open over 30 different file types in the web browser…such as pictures, Adobe Photoshop files, Adobe Illustrator files, even HD video, without you needing the required software installed on your computer or device. Maybe…well probably. Dropbox kind of has this market cornered for most consumers. They currently have about 45 million users and Google is hungry to capture some of that market share. But Google Drive offers some nice features and the additional free space is tempting. Also it seems that Google Drive will integrate pretty well with all of Google’s other services…Gmail, Google Docs, Google +. My opinion? Why not use both? They both have good free options so if you find your self nearing capacity on one service switch to the other for a while. You may find that you prefer one over the other and one day opt for their paid services. ← Tech Blog Contributors Needed!